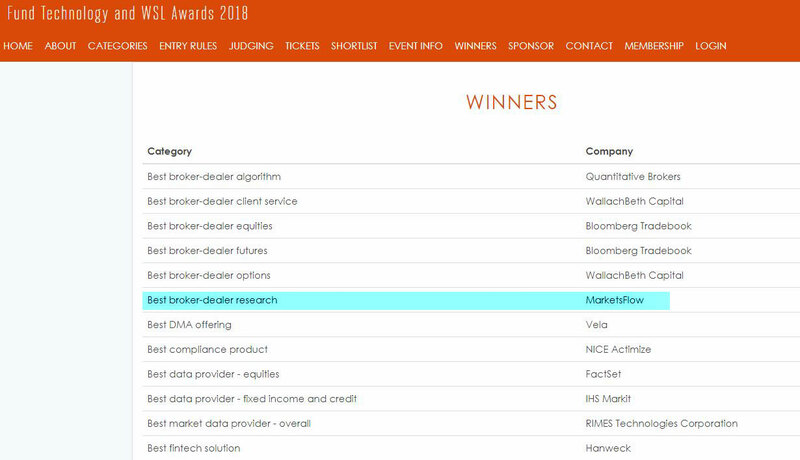 As I travel from New York city to our amazing Boston office, I could not be more ecstatic for MarketsFlow having won the “Best broker-dealer research” award at Fund Technology and WSL 2018 in NY – second year in row. Our fine firm is going from strength to strength, and I cannot wait for us to expand rapidly in the US. My meetings with some of the NY hedge funds managing AUM in excess of $5bn were nothing short of mesmerizing, thanks to our leading technology platform and the impact it will have in innovating scientific investment management. I hope that you enjoy the blurry iphone photo before we get the official ones from the organisers. I wish you a wonderful day back in the UK. The Fund Technology and WSL Awards 2018 winner page. Previous post: Congratulations, MarketsFlow, Inc. is now registered in State of Massachusetts – Next Steps! Next post: MarketsFlow is proud to be selected for DFSA – Dubai Fintech Innovation Testing License!